What do you get when you mix a musically charged college town with an urban playground, a nature lover’s Zen and all-encompassing ethnic cuisine? Downtown Austin. Bordered by MLK, Lamar, Cesar Chavez and I-35, the 78701 zip code is one of the fastest growing neighborhoods in Austin. In recent years the number of living quarters in the centrally located district has skyrocketed, now with nearly 10,000 Austinites—and implants—residing here, according to the Downtown Austin Alliance. Most of the growth has been up, not out, as the condominium lifestyle is prevalent across the area. Why would anyone want to give up owning land in Texas? To have some of Austin’s best restaurants, loudest music venues, largest parks and most diverse culture in their backyard. And, though condos might not be large, their amenities often make up for it. Though living spaces run the gamut from small efficiencies to spacious lofts, the average condo in downtown is between 1,200 and 1,400 square feet, two bedrooms, two baths, as kitchen and a living room. The average cost is $3 a square foot, and downtowners get bang for their buck. Being home to The University of Texas, voted one of the “hottest state universities” by Kaplan and Newsweek, downtown offers a myriad of intellectuals and some of the best educational opportunities—for all ages. From the renowned private Cathedral School of St. Mary, and St. Martin’s Lutheran School; to the public Austin High School, Mathews Elementary School and Pease Elementary. Founded in 1876, Pease is the oldest continuously operating school in Texas. Though Austin nets the urban with classic bright lights and black pavement appeal, it differentiates from other cities by slaking its more natural appetite. For those with an outdoorsy itch—and most who live in Austin are—downtown encompasses several sun-drenched activities: Lady Bird Lake, includes an 11-mile hike and bike trail; Zilker Park, offering the naturally fed Barton Springs; Auditorium Shores, a park housing several concerts and events, and Austin Botanical Gardens, to name a few. Activities range from historical walks and paddle-boarding, to frisbee and sports leagues of any kind—dodgeball, softball, soccer, football and kickball. On the other hand, if you’re looking to beat the summer heat and enjoy a Saturday afternoon indoors, downtown is a cultural Mecca. 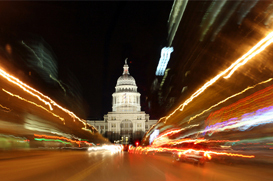 Home of the Austin Museum of Art and arthouse and many smaller galleries, the Texas Capitol, the Texas Music Museum, the legendary Alamo Drafthouse movie theatre, and Austin City Limit’s Moody Theatre, residents are within walking distance to the up-to-the-minute cultural happenings and deep-rooted history of Austin. And, for an after-dinner drink and dancing, downtown has an endless number of watering holes providing live music to get your cowboy boots—or wingtips—moving. A few of the most famous include Antone’s home of the blues, La Zona Rosa and Stubb’s.